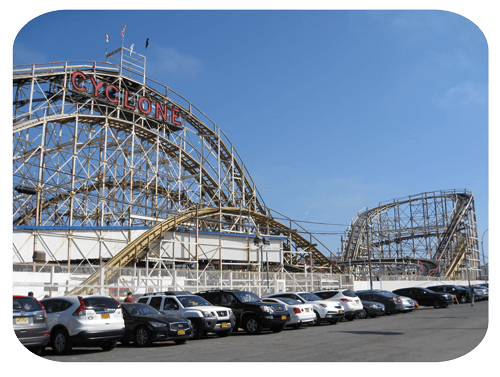 Welcome to the Cyclone, one of the world's most famous roller coasters. Ride it and you'll see why this 1927 ride was made a NYC landmark in 1988. Located at Surf Avenue and West 10th Street, it stands on the same corner where the Loop the Loop (1901 to 1911) and Giant Racer (1911 to 1927) once stood. The Cyclone is a classic from the Golden Age of roller coasters. This period lasted from roughly 1920 until the start of the Great Depression in the early 1930s. By the 1920s, engineers had figured out how to make roller coasters faster, safer and more economically viable. Their predecessors were rather violent and so accident-prone that many advertised themselves as "safety coasters" or hired a professional "brakeman" to keep the car under control as it sped around corners, which usually worked. The design challenge of the 1920s became how to thrill riders just enough without scaring them, to make them want to ride again... just like you'll want to do. Stop and see your picture at the booth as you leave. They're not cheap but always seem to really capture the moment! The Cyclone: A two-minute ride that feels like ten seconds.